Sandwiched between Central, Eastern, and Southeastern Europe, Romania is famed for its forested region of Transylvania, immortalized in myths and legends and known for its fantastic landscape of hills, mountains and vast plains. Bordered by the Black Sea, Bulgaria, Hungary, Moldova and Serbia, the country of Romania offers travelers a wide range of activities and sights, thanks to its large size and geographical variety. Black Sea beach resorts, such as Mamaia and the bohemian Vama Veche, welcome holidaymakers in the summer who enjoy the quiet beaches and swimming in the inland sea. The slopes of the Carpathian Mountains, which run through the center of the country, are home to a number of popular ski resorts, the most famous of which is the Poiana Brasov, close to the city of Brasov. For travellers on a tour of Romania who prefer to soak up the country’s culture and history, the well-preserved medieval cities and villages of mythic Transylvania, including Sibiu, Bistrita and Brasov, are home to a wide collection of historic buildings and monuments, including the world-famous Bran Castle, known as ‘Dracula’s Castle’ as the hilltop castle shares many aesthetic similarities with that castle of Count Dracula, as described in Bram Stokers iconic novel. Romania’s capital of Bucharest, in the south of the country, is the largest city and the cultural, political and financial center. It sits on the banks of the Dambovita river and is home to the Communist-era Palace of Parliament. Many tours of Romania begin in the capital, as it is the perfect place to experience the modern face of the country before exploring more rural and ancient parts. Romania is a land of great historical significance; it is here that the oldest known Homo Sapien remains in Europe were found, dating back 40,000 years and excavated in a cave in the south-west of the country. There were settlements in the territory of modern-day Romania since Neolithic times, and the country has undergone a long history of occupation and settlement across the centuries from the likes of the Roman and Turkish empires. A holiday to Romania offers travelers the chance to immerse themselves in the ancient history of the country by visiting sites such as the Roman ruins found in the city of Alba Iulia, in the west of the country. Romania gained independence from Turkey in 1877 and was subsequently declared the Kingdom of Romania under King Carol I in 1881. The 20th century proved challenging for the country as, although it joined the Allied Forces in World War I, the country suffered much loss of territory and persecution, particularly of its Jewish population in the first half of the century. Post World War II, there was a Russian Communist takeover of Romania which lasted until its sudden collapse in 1989, following years of heavy-handed rule and general poverty and repression of the masses. Today, Romania is an increasingly popular tourist destination which has helped boost the economy. In 2007, the nation joined the European Union and the country became easily accessible to more travelers, attracted by the stunning landscapes and numerous places of historical interest. Romania is proudly home to a number of UNESCO World Heritage Sites. The eight Roman Catholic painted churches of Moldavia, are a stunning example of the unique religious and artistic heritage of the country, whilst the wooden churches of Maramures, set in beautiful natural surroundings, showcase the country’s architectural ingenuity. The fortified churches and villages of Transylvania evoke the mysticism and old-world feel that Romania is famed for, whilst the historic center of Sighisoara, charms visitors with its colorful facades and cobbled streets. Art and architecture lovers will enjoy the Horezu Monastery in Wallachia, famed for its architectural purity, built in a Brancovan style and famously established as a school of mural painting in the 18th century. A tour of Romania is a fantastic way to discover a unique and wide variety of monuments and buildings which showcase the true character of the country. The country is known for being one of the worlds largest wine producers, with a heritage of viticulture dating back more than 6,000 years. A trip to a vineyard in one of the several wine producing regions such as Dobrogea and Moldavia is an unmissable activity during a trip to Romania. As well as plentiful vineyards, the country has an abundance of uncultivated land; around 27% of the country’s territory is covered by wilderness and undisturbed forest, home to wildlife such as brown bears and wolves. There are an amazing 13 national parks and 3 biosphere reserves in Romania, ensuring the preservation of the wonderful natural environment, such as Călimani, home to lynx and wildcats and the Danube Delta, a bird-watchers paradise. With a cultural mix of traditions, and a population ranging from ethnic Romanians to Magyars, Romanis and Transylvanian Germans and a strong Serbian, Russian, Ukrainian and Turkish influence, particularly around the Black Sea coastal areas, Romanian is a diverse country. Traditional folklore and dress are celebrated in the numerous religious and cultural festivities throughout the calendar year, such as the Bucharest of Old Festival, which revives the capitals ancient heritage, and the Sighisoara Festival of Medieval Arts and Crafts. 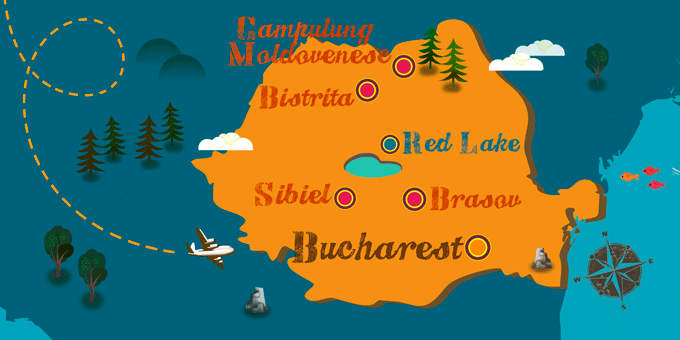 A package holiday to Romania is a journey through cultures and an adventure through a long and fascinating history. The country’s artistic architecture and unique sights make it the perfect choice for a tour, whilst it’s diverse geography welcomes skiers, hikers, and beach-lovers thanks to its mixture of mountains, forests and beaches.